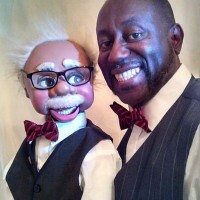 Comedy Ventriloquist to Open Dickens Parlor Theatre's 10th Season! Thinking about doing something fun and different this Valentine’s Day weekend? Bring your loved one to Dickens Parlour Theatre, but be careful, Mr. Goodwood has an eye for the ladies! Mr. Goodwood is the 102-year-old sidekick of ventriloquist Ken Huff. Together, they form a hilarious duo that will have you laughing all night long! Mr. Goodwood credits “chasing the ladies, but never catching them!” for keeping him young and in good physical shape. So, watch your girlfriend or wife, because Mr. Goodwood certainly will make a pass at her. Additionally, he has many thoughts and comments on todays news and events, McDonalds and just being old! Mr. Huff, a retired 20-year US Air Force veteran, and Mr. Goodwood have been performing, flirting and delighting audiences all over the world for the past 30 years. Tickets are $26 for adults and $18 for children and can be purchased by phone 302 829-1071 or online at www.dptmagic.com .